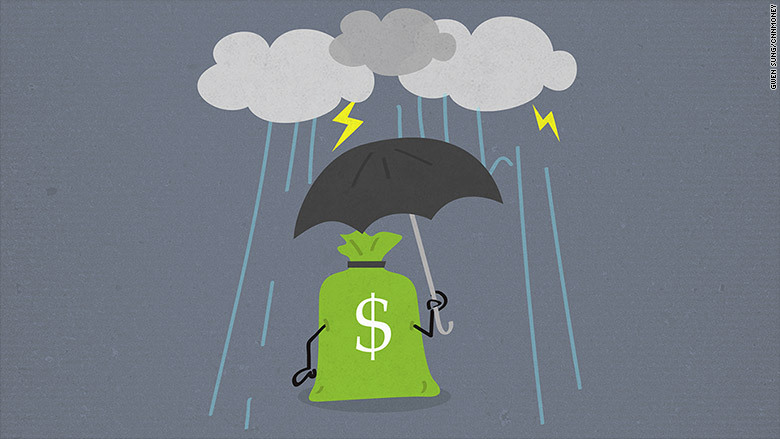 Bubble fears: Is it time to consider a rainy day fund? It's been mostly sunny on Wall Street for six years now as stocks have soared. But some investors are worried that the next rainy day could come soon. Stocks are pricey, we haven't had a correction in years, and America's central bank -- the Federal Reserve -- could shake things up in September. One place to weather the storm is a money market fund. It's considered one of the surest investments available, outside of stashing your cash in a bank account. Here's how it works: You put your cash into a fund, and the fund manager invests some of it in relatively safe bets: U.S. government bonds, corporate debt or municipal debt. The goal is to get people a better bang for their buck than just putting their money into a savings account, but keep the risk low -- far lower than investing in stocks or even most bond funds. "It often serves as a surrogate to a bank account," says Tim Huyck, Fideltiy's chief investment officer of money markets. Most people invest in a money market fund for a few months, often to try to beat the interest you get on a bank account. Related: Are you investing enough abroad? Attractive bet now: Money market funds, often called "money funds," could stand to win big from a Fed rate hike, which many believe will happen in September. "Money market funds become a nice alternative during these times," says Esther Chance, senior portfolio manager at Invesco, which manages $68 billion in money market funds. After a Fed rate hike, money market funds "definitely stand to win." A rate hike would do two things. First, it sometimes disrupts the momentum in the stock market, spooking investors to put money in safer assets. Second, it would bump up the interest that investors earn on their savings and bonds. Since the Fed put interest rates at near zero in 2008, money funds and bank accounts basically have given you the same return -- nothing. But historically, when rates are higher -- like they're expected to go this year -- money funds have higher returns than your average savings account. Experts say there are a few key questions you should consider with money market funds. 1. What type of fund do you want to invest in? Government, "prime" (corporate debt) or municipal. Generally, government is the safest and the other two are neck-and-neck in risk level. 2. What's the fund's rating? You can check on Moody's or Fitch to see a fund's credit rating. The top rating is AAA, which means the fund is considered an extremely safe investment. 3. Are you comfortable with fees and "gates"? Gates mean you can't withdraw money your money for 1 to 10 days. Consider how fast you might want your funds. Money funds growing: Money funds are a low-risk, low-return game compared to other investments like stocks. They are a popular investment that's grown in recent years. Over $2.6 trillion is invested in money market funds in the United States. That's down from recent highs during the recession, but it's still almost 50% higher than 15 years ago, according to data from Morningstar and Investment Company Institute. Like a bank account. But not exactly. The growth is impressive considering that over the same time span, there are half as many money market funds today as there were in 2000. Money funds have consolidated over the years into a few mega-powers players, like Fidelity and Vanguard. The historically high amount of assets in money funds could be a sign that investors of all stripes are preparing for the next downturn, experts say. But: "Money funds are not guaranteed," says Fidelity's Huyck. Unlike a bank account, which is insured by the federal government up to $250,000, investors can lose cash in a money fund. It is an investment at the end of the day. One of the worst examples of what can go wrong was a money fund group called the Reserve Fund. During the Great Recession, it disclosed to its investors that it "broke the buck," meaning investors only got 90-some cents back for every $1 they put into the fund. They lost money. Why? The fund had invested in Lehman Brothers, which went belly up. New rules coming: Money market managers learned their lesson and have been a lot more cautious since the financial crisis. Regulations put in place after the financial crisis in 2010 by the Securities and Exchange Commission make money funds much more transparent and diversified today, experts say. New rules that arrive in 2016 could change the game too. Some funds will be allowed to impose up to a 10-day gate in 2016, meaning investors can't pull out their money from the fund for 10 days. Fees could go up to next year too, depending on the type of fund.